We often discuss the social implications of gender equity on the American employee, but rarely do people look at the overall financial impact. America is losing money, and at the same time we are losing a growing percentage of our workforce—women. The labor force participation of women in the United States has been in decline since 2000. Participation peaked in 1999 at 60% but has since dropped to 57% (Harvard Business Review). The Federal Reserve Bank of New York last December released their most recent Labor Market Survey. The survey points to a bleak overall outlook—especially for women in the workplace. Information for the survey, released every four months, and collected from around 1,300 participants, provides a data-driven look at the current state of the American labor market, and points to an overall trend of dissatisfaction among workers, both women and men. The report shows American workers of both genders are dissatisfied with the promotion opportunities (or lack thereof) afforded to them by their current employers, and are equally unhappy about the wages being offered. Women, however are impacted more broadly by factors listed within the latest SCE survey, released in December, which shows an overall decline in satisfaction surrounding wage growth for women, and a lower percentage of satisfaction with promotion opportunities than their male counterparts. The findings, culled from a recent e-book from the Hamilton Project at Brookings called 51%: Driving Growth Through Women’s Economic Participation, show how these current workplace trends are presenting barriers to women working to achieve career and financial success, and demonstrates how this presents a significant economic concern for the United States. Former Federal Reserve Chair, Janet L. Yellen, in a speech to Brown University alumni last May, also discussed the impact of gender inequity on economic growth and productivity in the United States. In her speech, Yellen explained the U.S. could boost financial growth and productivity by eliminating obstacles that inhibit women’s participation in the American workforce, and the potential for future economic loss should current conditions persist. Eliminating the gender equity gap will have a positive economic impact on the American business landscape overall, not just for women. In the U.S. closing this gap has the potential to unlock economic gains to the tune of $2T, and, despite discouraging reports on the length of time it will take for us to achieve global gender parity, the broadly held view of gender equity as a matter of mere social significance is fading to the background as more businesses start to view this as a labor market imperative. McKinsey Global, in a study published in January titled, ‘Delivering Through Diversity’, reaffirm the business case for expanding diversity and gender equity in not only the American workplace, but for companies globally, using data and past studies to demonstrate the potential for positive financial outcomes from closing the gender equity gap. The study found companies who have embraced gender equity at the executive-level, consistently outperform their competitors, showing that gender equity isn’t a social issue, it’s a matter of good business sense. Companies in the bottom quartile for both gender and for ethnicity and race are statistically less-likely to achieve above-average financial returns than the average companies in the data set (that is, bottom quartile are lagging rather than merely not leading). Closing the gender equity gap leads to higher profitability, it’s that simple. According to McKinsey, “companies are still uncertain about how they can most effectively use diversity and inclusion to support their growth and value-creation goals.” That’s where Pipeline comes in. 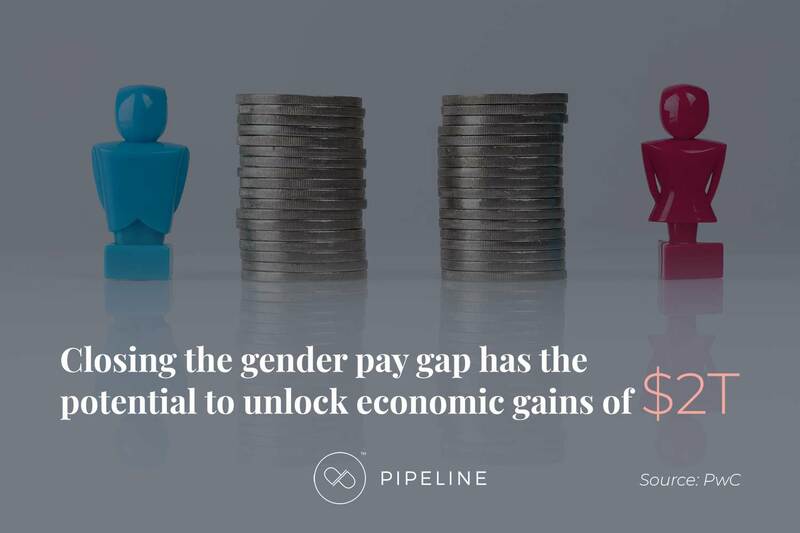 We’ve developed a SaaS platform that makes use of Artificial Intelligence and works with your Human Capital Management System or CRM, to assess, find, solve, and monetize closing the gender equity gap within your business, thereby unlocking a wealth of positive economic outcomes. Is your company missing out on this massive economic opportunity?